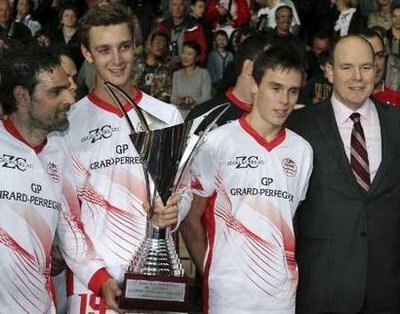 (l to r) Marco Simone, Pierre Casiraghi (son of Princess Caroline), Daniel Ducruet (son of Princess Stephanie) and HSH Prince Albert II of Monaco pose with their trophy after a football match organized against the drivers of today's Forumla One drivers. The match was held at the Prince Louis II Stadium and benefited AMADE (World Association of Children's Friends) which is based in Monaco and under the patronage of Princess Caroline to help unfortunate children around the world. Charlene Wittstock, longtime girlfriend of Prince Albert II, and British actress Elizabeth Hurley pose on their way to attend a charity fashion show in Monaco ahead of the Formula One Grand Prix which is being held in the Principality today.